But not just any truffles, these are the now legendary Christmas Truffles (although, as Scrooge, after he changed, proclaimed that he would keep Christmas in his heart all year round... And he was as good as his word, so maybe he had his housekeeper make up a batch in the middle of summer just to inspire a little Christmas magic in July... But I digress). 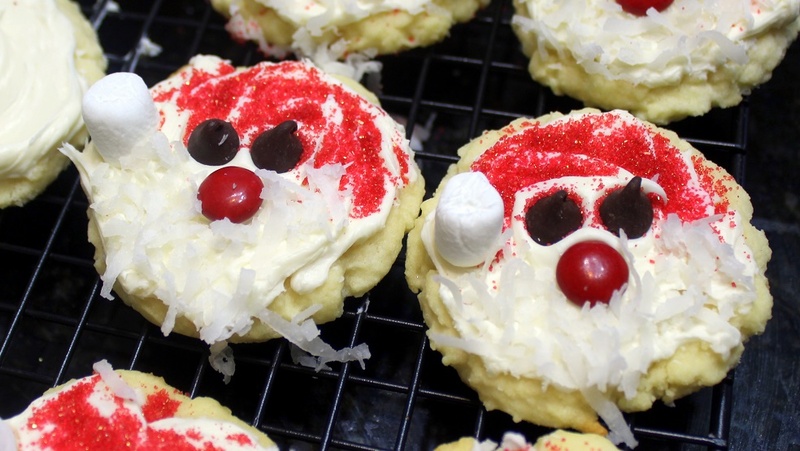 These are now my GOTO Christmas Cookie. 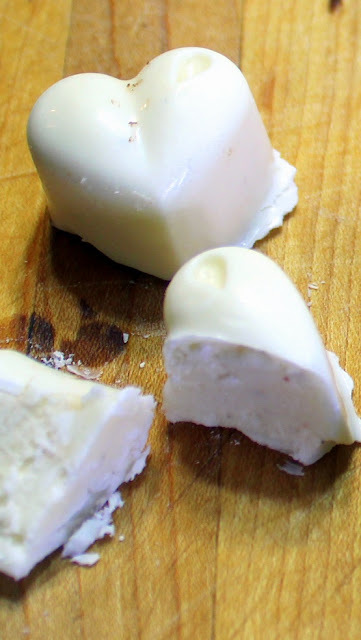 Soft center (think fudge), with a thin coating of white chocolate. But best of all, this has the unmistakable tastes of that seasonal beverage... EGG NOG. Please note, the photos are of chocolates made in a chocolate mold. 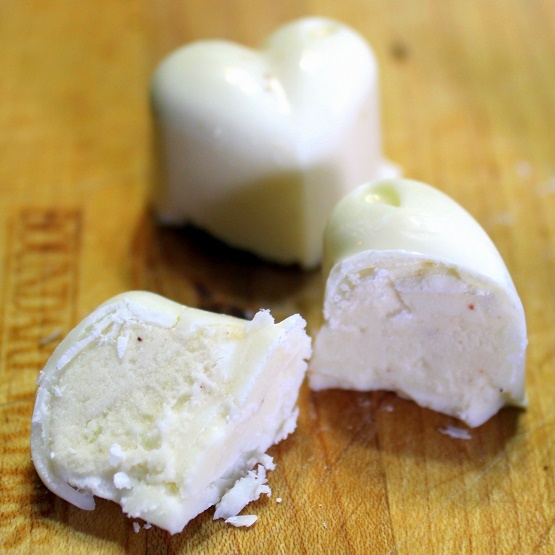 Not very difficult to do, but I usually make these in a round truffle shape. The day I made a dozen "fancy" chocolates I also made 3 dozen small half golf ball sized and shaped truffles. Unfortunately, I did not get any photos of them. 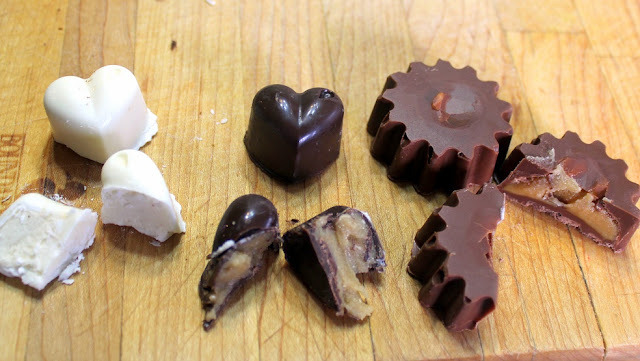 So you will just need to imagine the molded chocolates as round easier to make truffles. I took these to an after church event and they flew off the shelf. By far the most popular of the holiday chocolates I made. And really, Yo Ho Ho and a Tablespoon of RUM... What's not to love. 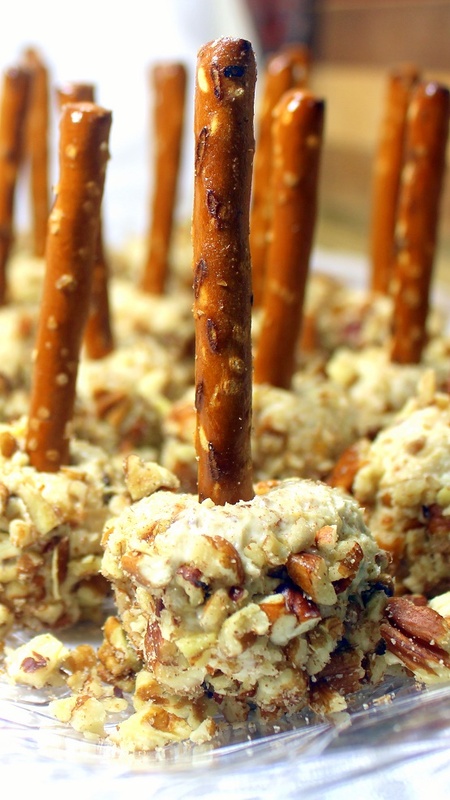 Easy to make, no bake and delicious! Line large baking sheet with waxed paper; set aside. Combine eggnog, butter, rum and nutmeg in 2-quart saucepan. Cook over medium-low heat 4-5 minutes or until butter is melted. 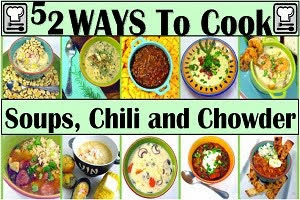 Add white chocolate chips; continue cooking, stirring constantly, 2-3 minutes or until chips are melted and mixture is smooth. 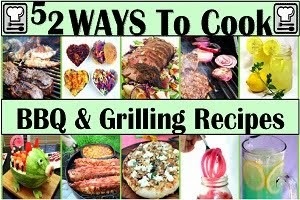 Cover; refrigerate at least 2 hours or until firm. Dust hands with powdered sugar. Shape mixture, working quickly, into 1-inch balls. Truffle mixture will be soft. Repeat dusting hands with powdered sugar to make shaping easier, if necessary. 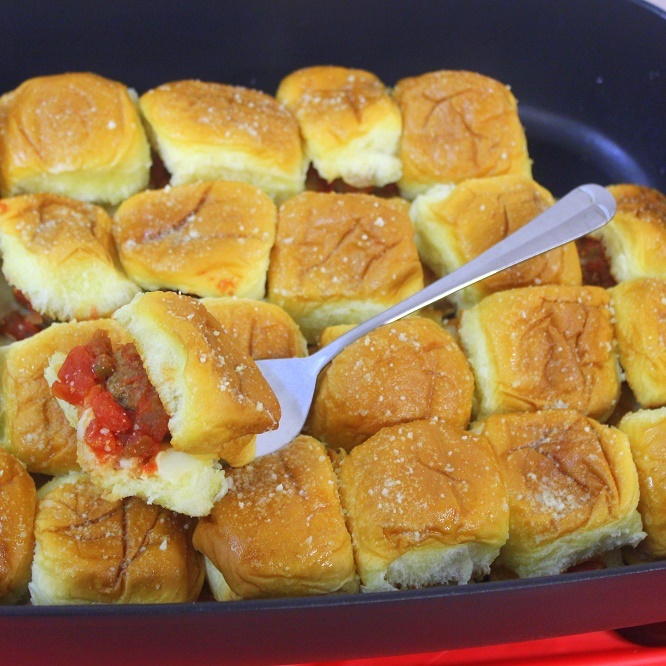 Place balls onto prepared baking sheet; refrigerate at least 1 hour until firm. Melt candy coating in deep 1-quart saucepan over low heat; stir 8-10 minutes or until smooth. Remove from heat; cool 10 minutes. Store refrigerated in container with tight-fitting lid up to 2 weeks. Serve Room temperature and ENJOY! But not just any cake, this is the legendary star of any 1950's housewife's afternoon tea, After all, 1950;s TV Sit-Coms inspired an entire generation of women. 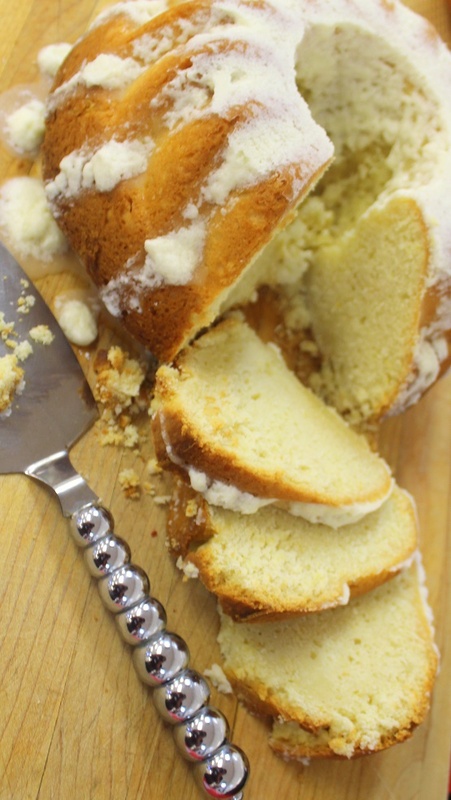 But, more than the shape, this Bundt is also deliciously filled with citrus flavors. I made this for an after church social hour. The ladies of the church were very complimentary. This is a very grown up cake. Not too sweet yet loaded with flavors. It's not a cake for kids, but with the right group, this will be the hot of the party! In a Large mixing bowl, sift together the dry ingredients; Flour, Baking Powder, Salt. In the bowl of a stand mixer, cream together the Butter and the sugar until light and fluffy, about 5 minutes. With the mixer running, add the eggs one at a time. Add the Lemon Juice and the Lemon Zest to the mixer as well as the ground ginger. And finally, still with the mixer running, add the Sour Cream and the buttermilk. Fold the Wet ingredients into the dry. Use a folding motion, digging to the bottom and fold the bottom mix to the top. Repeat folding until the dry ingredients have fully incorporated. Do not over mix or your cake will be very dense. 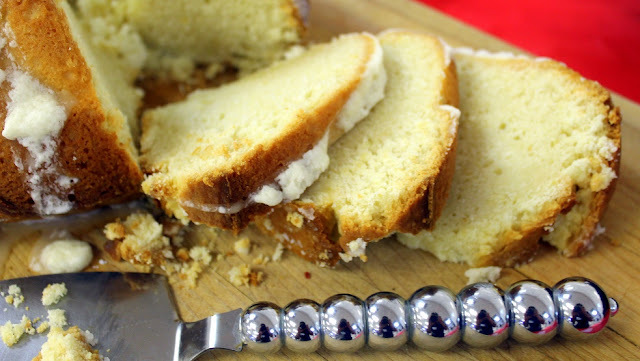 Pour the cake batter into a bundt pan that has been generously sprayed with baking spray. Bake for 80 minutes until the cake has fully baked and a toothpick can be inserted deep into the middle of the cake but still comes out clean. Any bit of wet on the toothpick, return to oven and bake for an additional 10 minutes. Check again, repeat as needed. Remove the cake from the oven and allow to cool for 5 minutes. Turn the cake over on a cake platter or, I like to serve cakes on a cutting board for presentation. 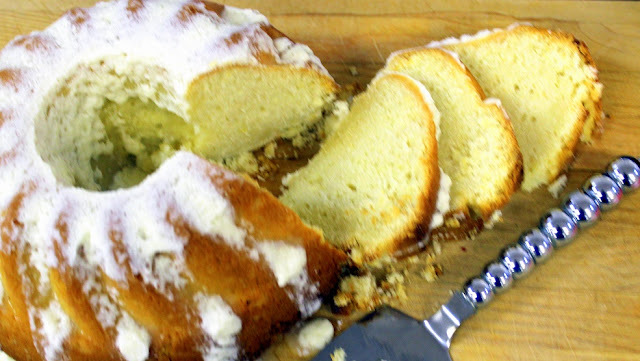 While the cake is cooling, make the glaze... 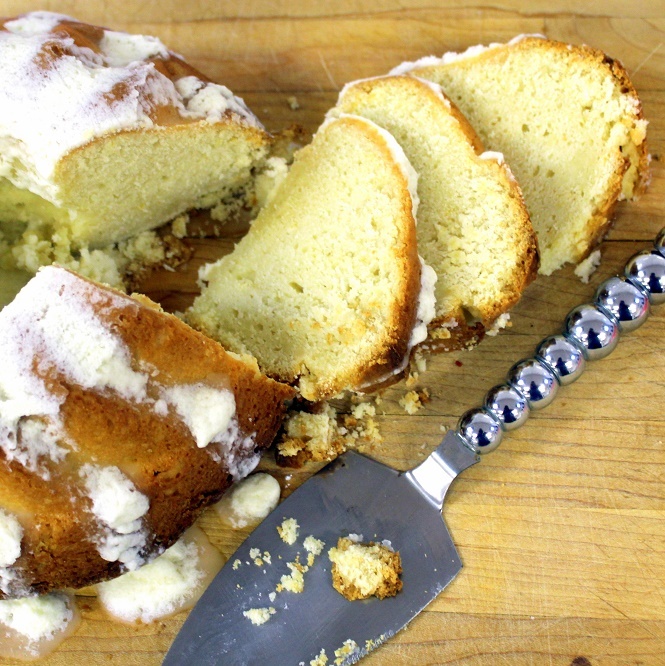 Mix the all the ingredients (Cream Cheese Lemon Zest, Lemon Juice and Powdered Sugar) together until smooth and creamy. Drizzle this over the Cake while still warm. Let the cake cool to room temperature. Serve Room Temp and ENJOY! 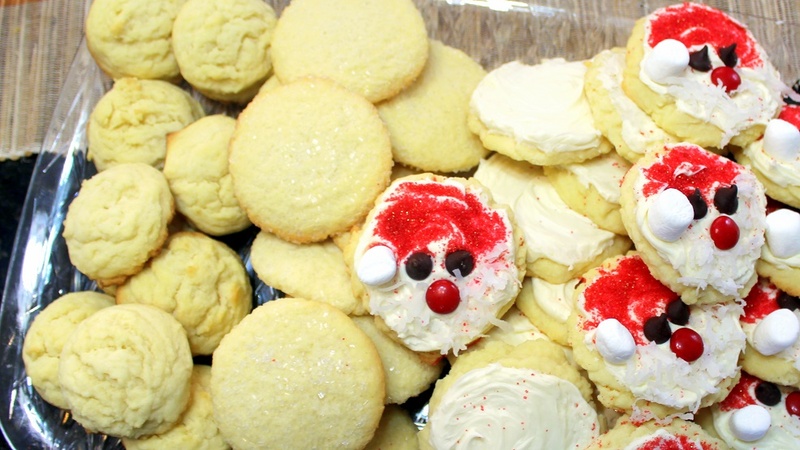 But not just any Christmas cookies, these have a deep Almond Flavoring that just melts in your mouth... Literally, That's why they are called meltaways! 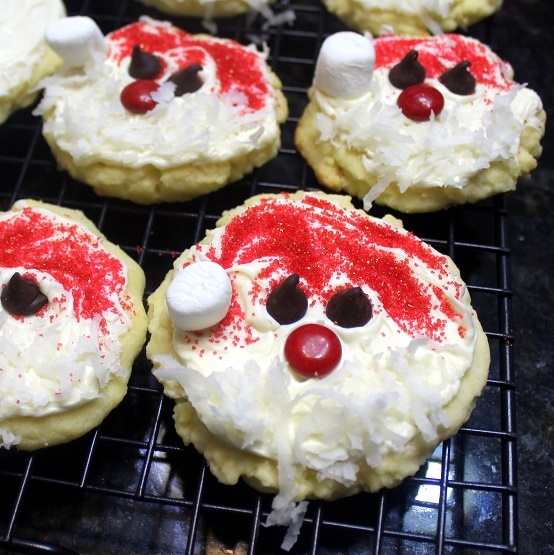 The Santa look is very easy to make. 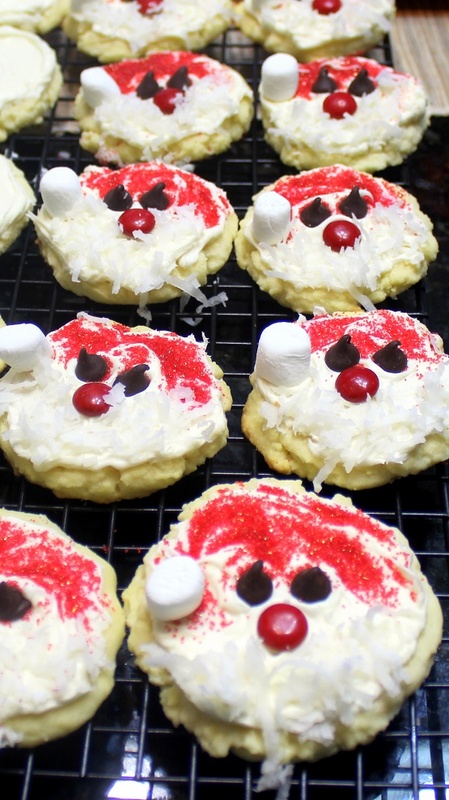 M&Ms for the nose, Red Sugar sprinkles for the hat and chocolate chips for eyes. All topped off with a mini marshmallow for the tassel of the hat and shredded coconut for the beard. 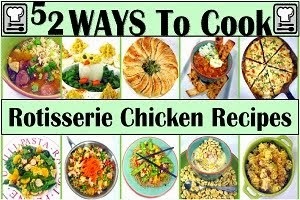 BTW, take a look at the photo below,,, You can use the same recipe a variety of ways... Don't ice them, bake as a ball to get a half dome look. Lots of Almond flavor but less sugar, less sweet. Just Ice them... Add a little Almond Extract to the icing for even more Almond flavor. Before baking, roll the balls in Decorator Sugar Crystals , flatten with a cup and bake normally. 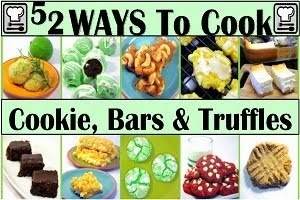 One recipe... 4 TERRIFIC COOKIES! Fold in the wet ingredients with the dry and continue to fold until fully combined into a dough. Working in batches, Roll the dough into 1 TBS Balls. Arrange on the cookie sheet. Flatten each into thin discs. 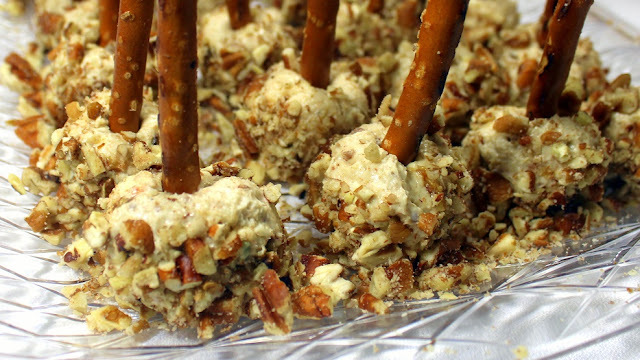 Serve with a Cold Mug of Milk and ENJOY! 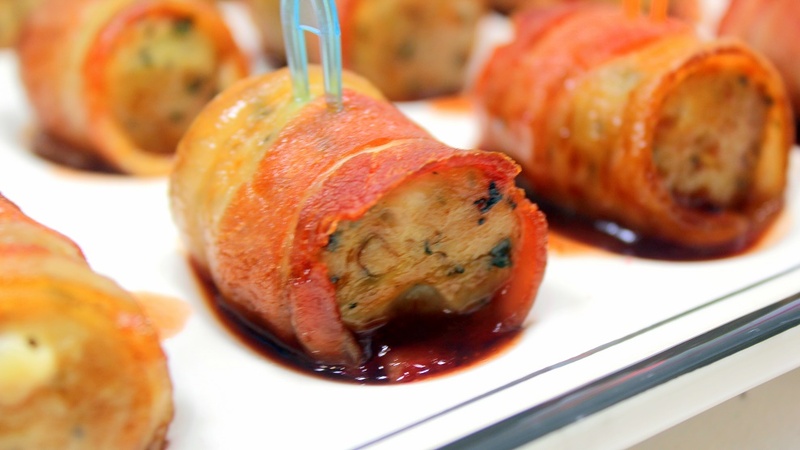 This is a bit of a new presentation for a great little appetizer. More commonly these beauties are made with a frozen meatball and wrapped in bacon. 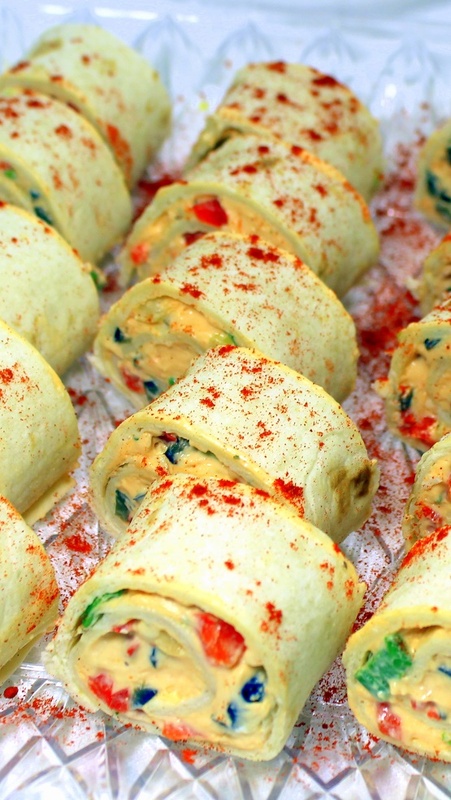 Grillmasters love to serve these as appetizers at a back yard BBQ in the summer. 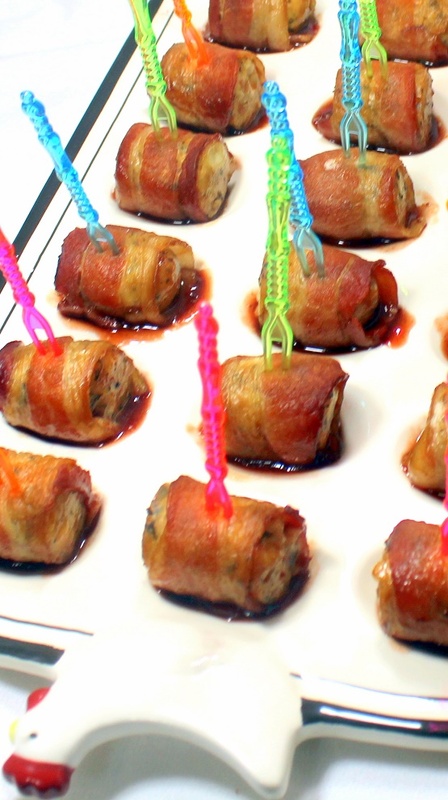 Here's a presentation idea that almost makes them classy enough for a Party! 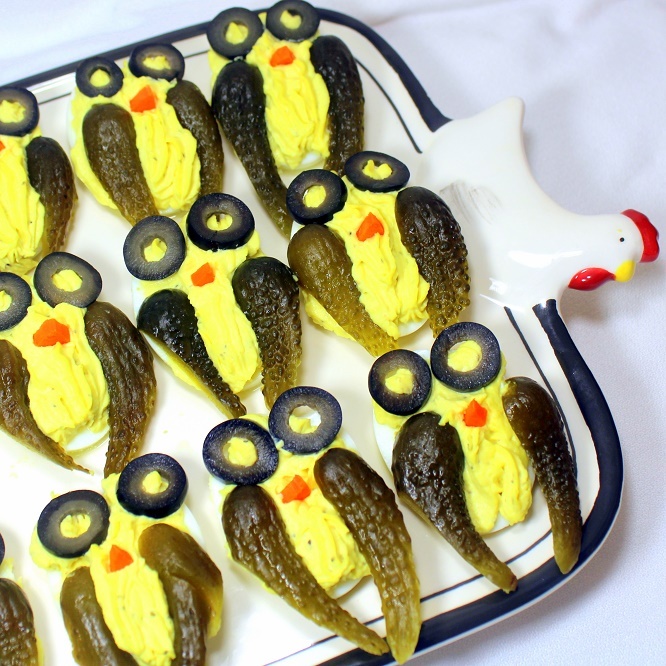 Dig out your Grandmother's Deviled Egg Presentation plate. 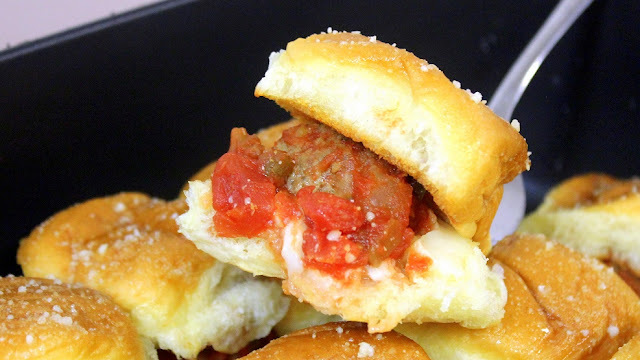 The divots are a great way to add an individual dipping sauce without the need for a dipping bowl. It may not be dinner at the Vanderbilt's, but it is just a tad classy looking. 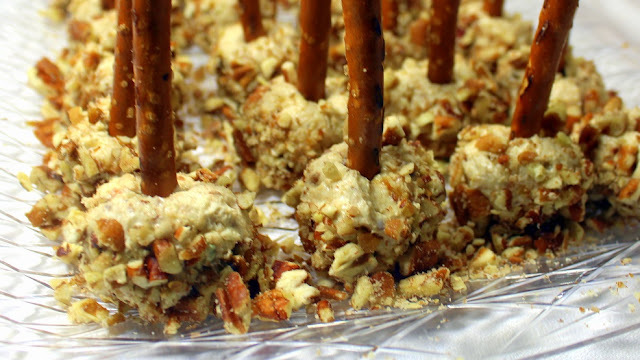 A couple of weeks ago I posted the recipe for the IMPOSSIBLY EASY, INCREDIBLY CHEAP Legendary - MOINK BALLS. You may remember that MOINK stands for Moo Plus Oink or Beef and Pork. 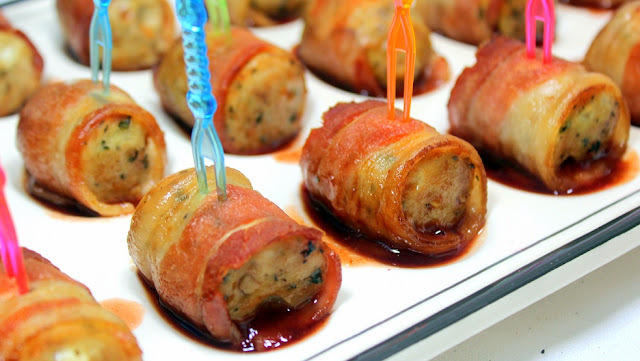 Beef meatballs wrapped in pork bacon. There are dozens of variations, Chicken Meatballs (Cloinks? 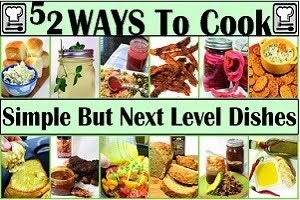 ), Pork Meatballs (the Oink-Oink), add a piece of pineapple for the Hawaiian Moink or even Turkey Bacon with Vegetarian Meatballs (The Veggie Gobbler). Well, here you go. I was wandering around the store looking for bargains the other day. I found a package of beautiful Artisan chicken brats. They were fresh made a few days ago but the shelf life had dropped to "Must Cook within 2 Days"... So I did. These taste much different than the Moink Ball. 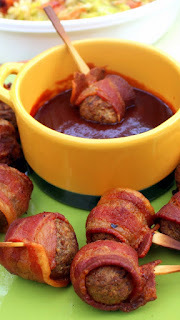 While I love the Moink Ball, they do have a processed taste (remember, we used frozen pre-cooked meatballs). These have a much more premium taste with the artisan sausage. Definitely an upgrade. 6 Chicken Sausage Brats each brat cut into 4 pieces, each piece the width of a Bacon Slice (24 total "Balls"
Prepare the CLoink Balls, Wrap each Piece of Chicken Brat (hereafter, called a Meatball) in a Half piece of Bacon. Bake in a preheated 400 degree oven for 15 Minutes (25 minutes if using thick sliced bacon). While the balls are cooking, make the sauce. Over medium heat in a small sauce pan, mix the Jelly and BBQ sauce. Stir to evenly mix. But not just any cheese balls, these are a wonderful twist on the classic cheese ball. Everyone loves food on a stick. Bacon Lettuce and Tomato mini cheese balls (You can even come up with a clever way to work a Pretzel Bun into the title since there is a pretzel in the appetizer. 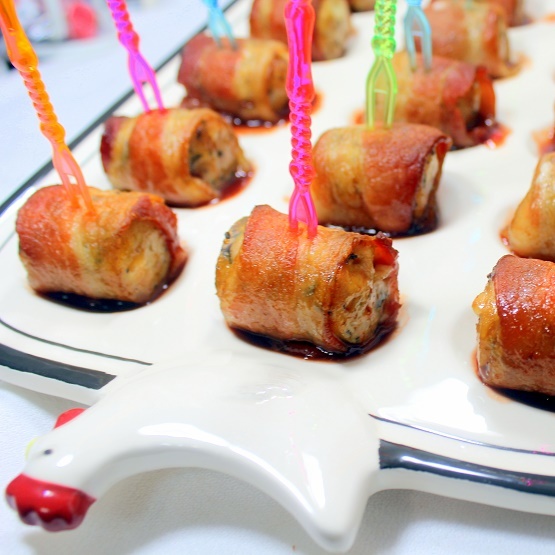 This is a wonderful little idea for a party or when you are asked to bring a plate of Appetizers. After all, everyone LOVES food on a stick! 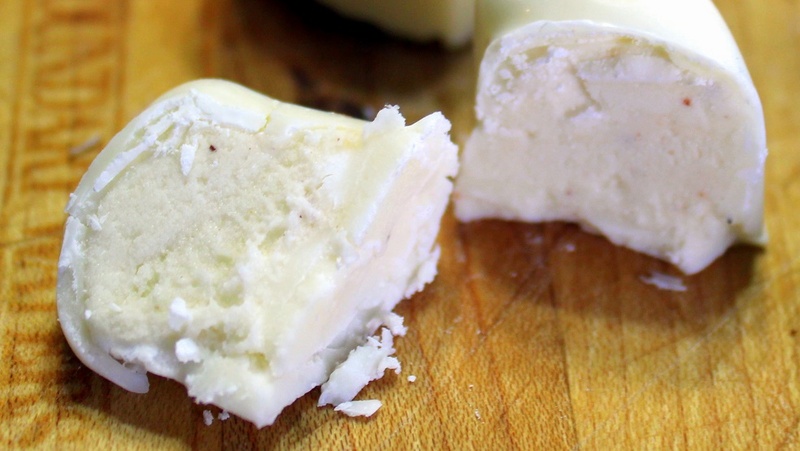 In the bowl of a stand mixer, combine the cream cheese and goat cheese. Using the whisk attachment, whisk the cheese until fluffy. This will take about 5 minutes. You will need to scrape the sides of the bowl down frequently and tap the sides of the inside of the bowl with the whisk attachment to free up clogged chunks. You may need to add additional creaminess to the cheeses to get a creamy fluffy texture. I add a bit of Mayonnaise. Add the figs and fold by hand to mix. Divide into 24 equal size pieces, roll them into balls. 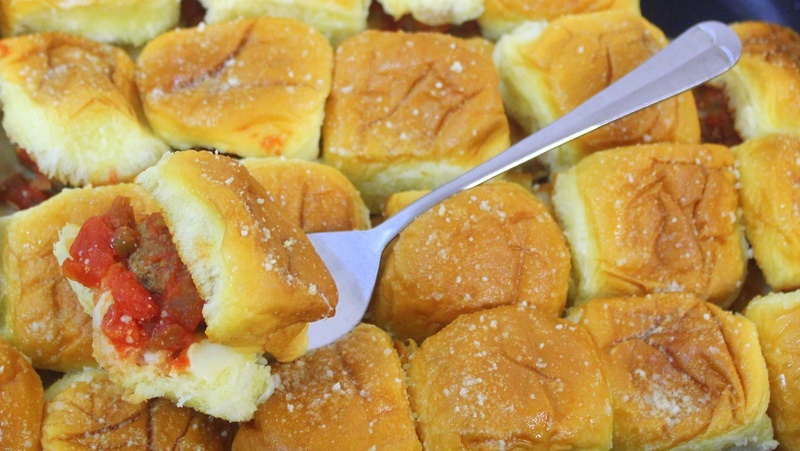 Especially if you have kids for your event, these will move like hotcakes... better actually. 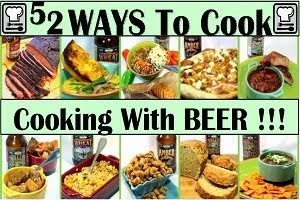 The star of this recipe is the look. Very easy to make. Just cut the pickles to the right size, thin slice the olives for the eyes and pie wedge shaped tiny carrot pieces for the nose. 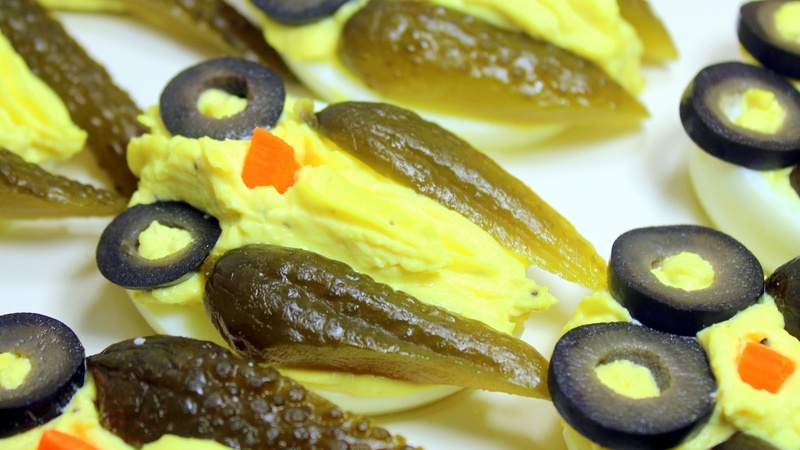 The actual recipe for the yellow deviled goo is my version of the classic Grandma's Dill Pickle version. 18 Large Eggs (NOTE: you will need extra yolks for this look, lots of yellow goo for center body and two side strips to hold wings and eyes at the head... 18 whole eggs will only make 24 deviled eggs halves), Hard-Boiled and Peeled (I always make at least 14-15 eggs just in case some do not peel well... Then I make Egg Salad from the leftovers). Follow the Blue Letter Link for an Easy to Follow Photo Essay on how to peel a dozen eggs beautifully! In that small bowl, Add the Mayo, Pickle , Mustard, Salt and Pepper to the Egg Yolks and mix until creamy. You will need to smash the egg yolks to get the mix creamy. Add additional Pickle relish liquid or Lemon Juice if the mixture needs to be smoother. Add carefully, the yolk goo gets too wet and the piping look will not hold. Fill the hollow of each egg just to the edge of the crater. 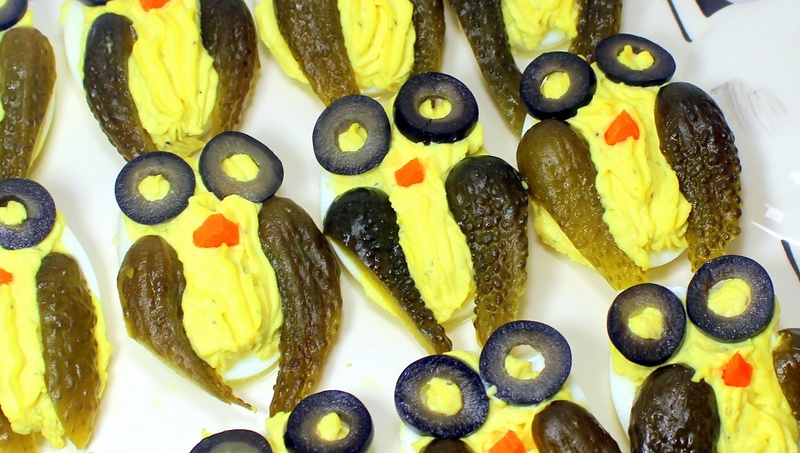 Then make three strips of filling across the top of the egg the two sides hold the wings and the center makes the body of the owl. 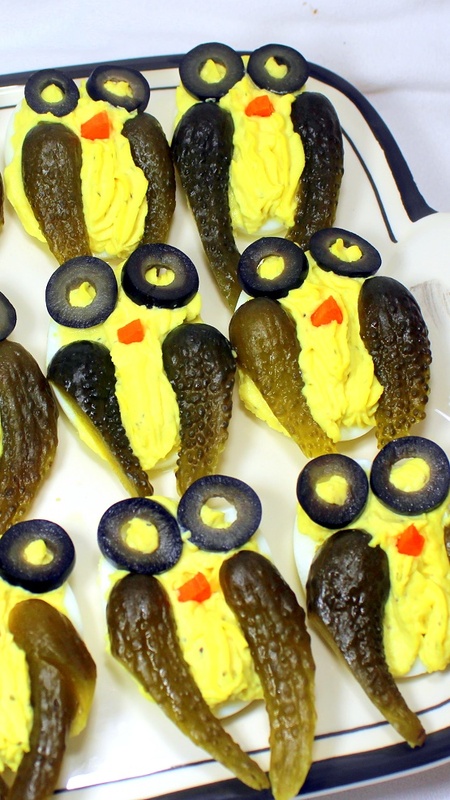 And now, make the owls... Two Pickle pieces for the wings, two Olive slices for the eyes and a carrot nose. Store loosely covered with cling wrap. But not just any meatball sliders. 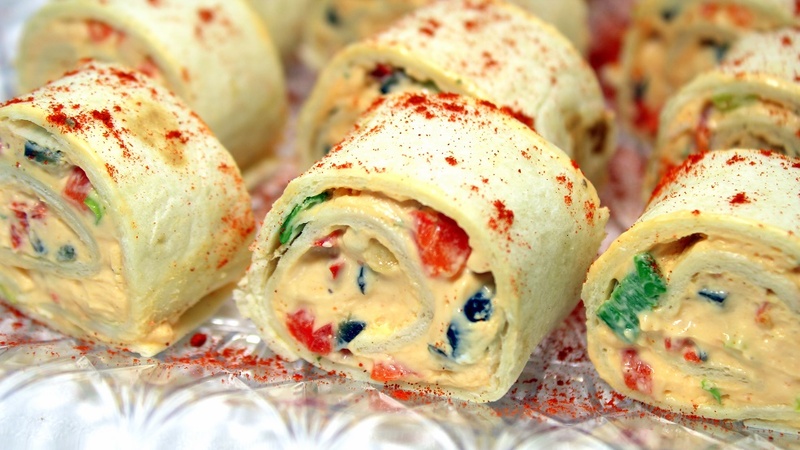 these little gens are a perfect year round party food, perfect for the "Big game", Cinco de Mayo party or just because. 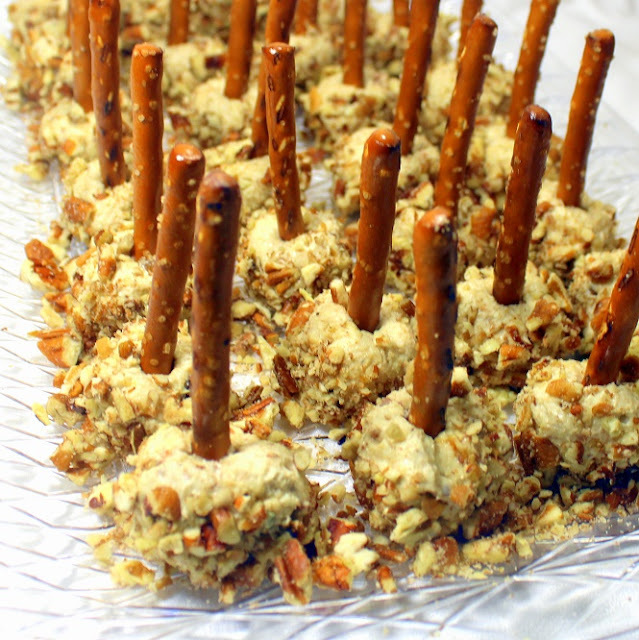 They are incredibly fast and easy to assemble since they only use store bought ingredients. Yeap, this is a "Bag of Frozen Meatballs" upgrade. A Little toasting and an extra brush of butter and Viola... I mean 'OLE! Thaw the meatballs according to package directions. Separate each bun. Arrange tops and bottoms, cut side up on separate cookie trays (remember to arrange so you know which top goes with which bottom) on a cookie sheet, toast both sides, the cut side up. I set the oven to broil and toast for just 3-4 minutes. Watch them so they do not burn, just a nice toast (See first photo in the collage). Add the tops. Brush with melted butter and generously sprinkle with Parmesan Cheese. 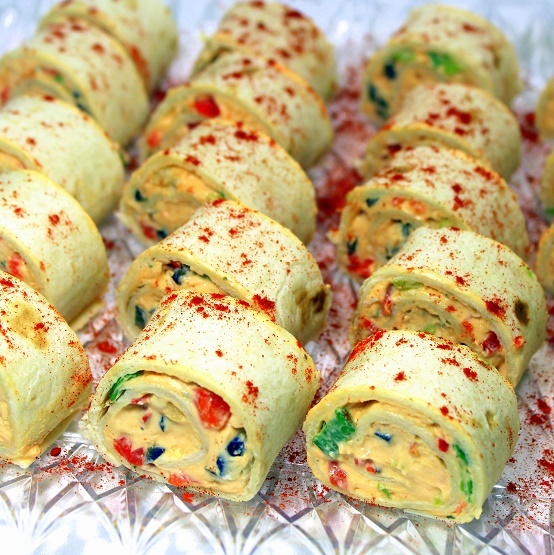 But not just any Pinwheels, this is a GREAT idea for a Holiday Party with the colors. 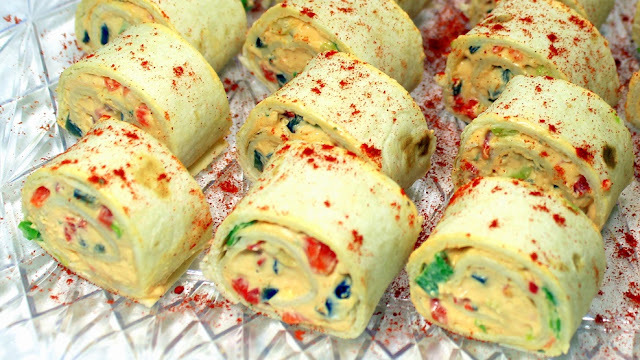 Anything red and green accented becomes a holiday appetizer. 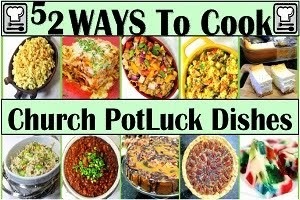 But it is also a great way to use up a few leftovers from Holiday cooking. Got a few extra Green Onions... Here you go. Only need to use half a Red bell Pepper... Here you go again. Got a few Black Olives left../ Well, you get the idea. Hunt down bricks of cream cheese on sale. Two weeks before Thanksgiving many store put cream cheese on sale for about a dollar a brick. Go ahead, buy a dozen. Cheesecakes, pinwheels, Cheese Balls. Dips... All sorts of ideas. 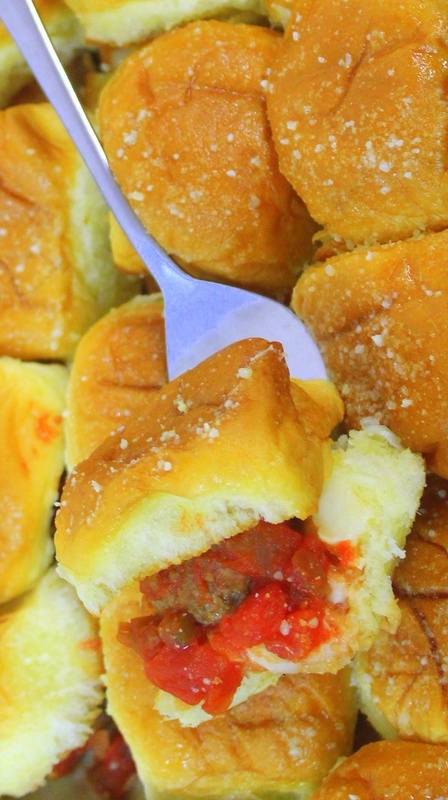 Betcha you can use up all dozen before the holidays are over. Suddenly these Beautiful Tasty Appetizers become not just affordable but actually cheap... About a quarter apiece. What a deal! Love the Ranch spice mix. I fund a spicy Ranch spice mix to mix into the cream cheese base. Added a fantastic surprise flavor. 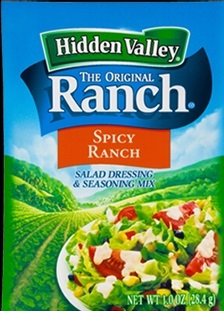 If you have sensitive palates that you want to please with less spicy foods, feel free to use the Original version of the ranch mix (and probably want to avoid the Olives as well). In the bowl of a Stand Mixer (KitchenAid), Add the cream Cheese and the ranch spice mix together and mix until creamy. I use the whisk attachment and scrape down the bowl frequently. This will take about 5 minutes to get the whipped texture. Add the 'Fixins, the Red Bell Peppers, the Green onions and the Black Olives and fold until well combined and evenly mixed. I do this by hand. Spread your tortillas out and evenly distribute cream cheese mixture among tortillas and spread just shy of the edges. Roll up the Tortillas. Not too tightly or the goo will seep out the ends. Wrap in plastic cling wrap and refrigerate for at least 3 hours or overnight. Unwrap and Slice into 1/2 inch Pieces, Arrange attractively on a platter. Sprinkle a little Smoked Paprika for extra flavor and color presentation. Wrap the platter and return to the fridge until ready to serve. OH BOY Bacon wrapped ANYTHING! 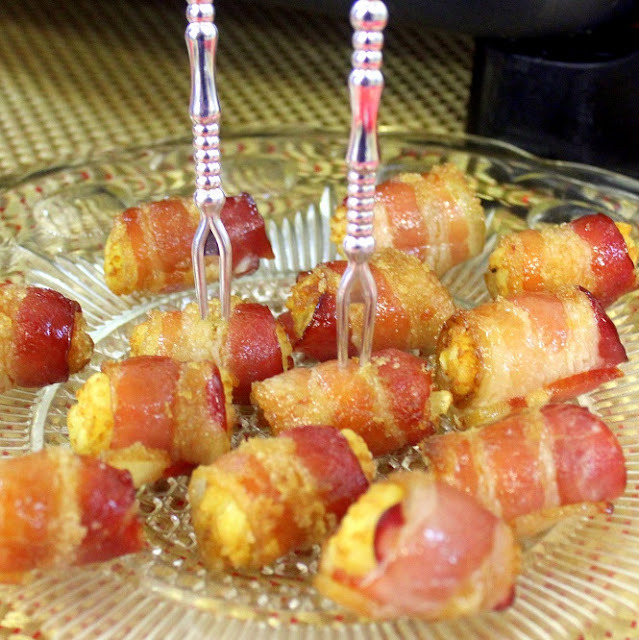 But these little gems are not just anything, these have that wonderful combination of Heat (I used a sprinkle of Cajun Spice mix) with the sweat of Candy Bacon. 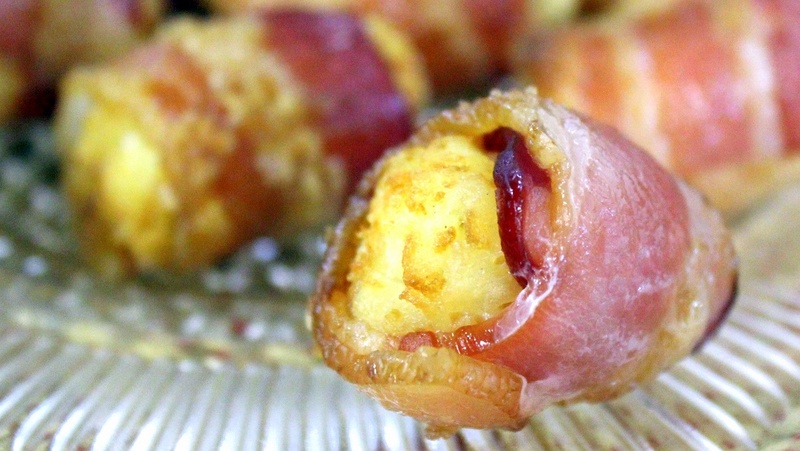 All that heat/sweet flavor wrapped inside a savory piece of grated potato and BACON! These beauties will become the most popular and talked about appetizer for your party, pass a plate event, potluck or any big family gathering. Put out a plate and bang they are gone, leaving that frou frou Foie Gras appetizer your sister-in-law spent hours making in the leftover pile. 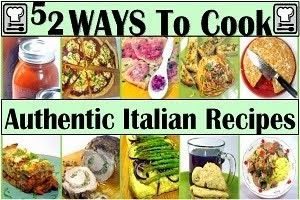 Only 4 ingredients, easy and fast to assemble and popular! Wrap each frozen tater tot in one of the cut bacon pieces. Bacon will overlap by a fraction of an inch. 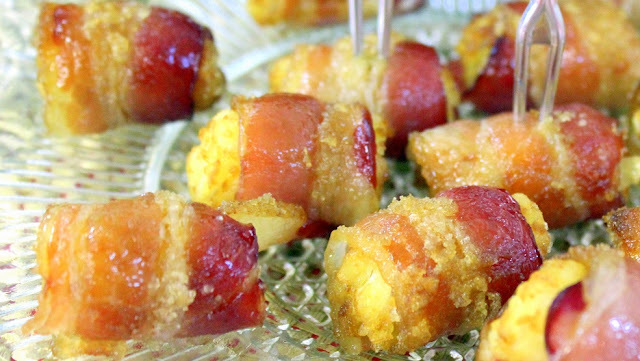 Roll the wrapped tot in the brown sugar coating all around. Place the tot seam side down on the wire rack. Repeat with remaining bacon and tots. 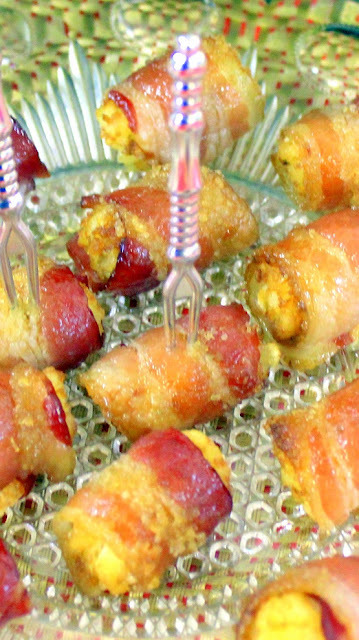 Sprinkle the Spice mix on top of the bacon wrapped tots. Bake for 20 minutes, check the crispiness of the bacon (I check the color). Continue to bake at 5 minute intervals until the bacon is a beautiful crispy cooked bacon color. 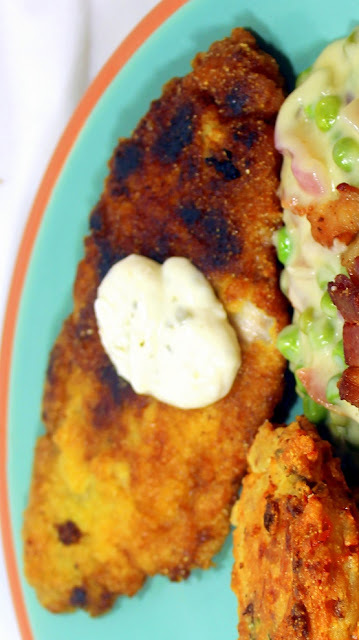 Cornbread fried Catfish was a weekly (or more) dish from my youth. For a while, mu grandfather ran a bait shop on the St Francis river where it meets the Lake Wappapella dam in hillbilly country of the eastern Ozarks. Whenever I visited I read up on my 'Lil Abner comics so I would fit in. My Grandmother passed when I was young, but I can still picture her standing at her stove with her can of lard beside her and these gems frying up in her cast iron. 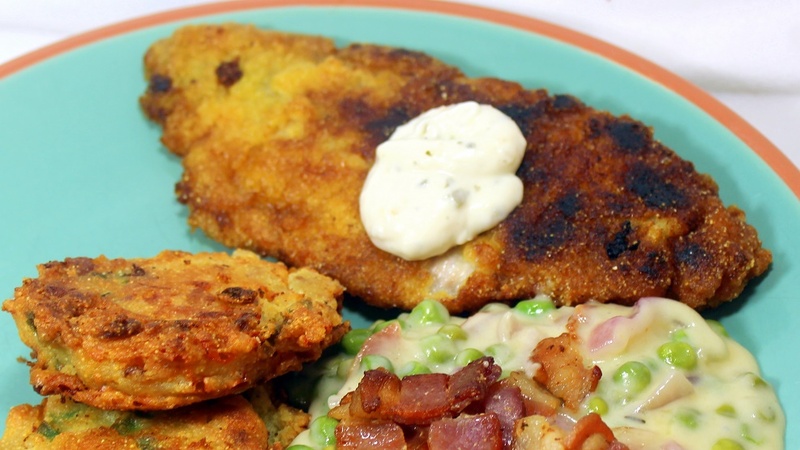 'Course the best tasting version of this recipe came from out back along the river when family, friends and neighbors of my grandfather would set their skillet over an open fire, fillet their catch of the day and fry em up right there. Grandpa had that box of cornmeal and lard handy for just those folks. My version has been citified a bot. I fry in Canola Oil and use the pre-mixed Cornbread Jiffy Mix but the tastes are there to always bring back those memories of family passed and good times. This particular Catfish was the centerpiece for one of my very favorite meals I have made in a long time. 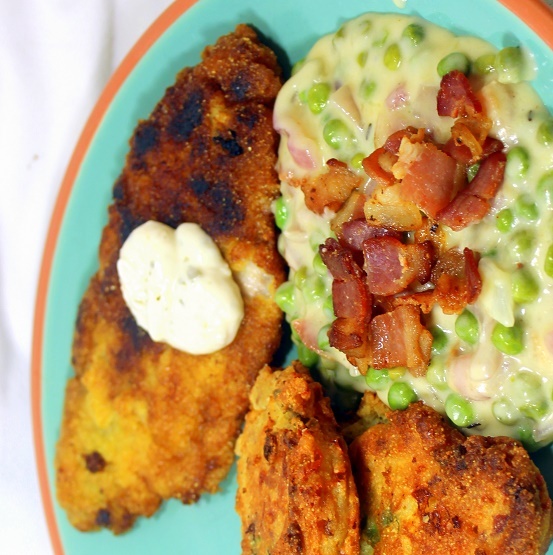 Fried Cajun Jalapeno and Cheddar Corn Fritters and an incredible Cowboy Bacon Creamed Peas side. Just a fantastic meal! VERY IMPORTANT... "Dry" each of the fillets with paper towels to prevent a gummy coating. Set up three stations, a plate with the flour... A bowl with the whipped eggs... A plate with the Jiffy Mix combined with the Old Bay seasonings. Dredge the fish fillets in the flour, well coating both sides. Immediately, Dip the floured fillets into the eggs coating both sides, Immediately dip the egg coated fillets into the cornmeal well coating all sides and finally, immediately fry in the hot oil. If needed, work in batches so the fish does not overlap in the oil. No crowding. 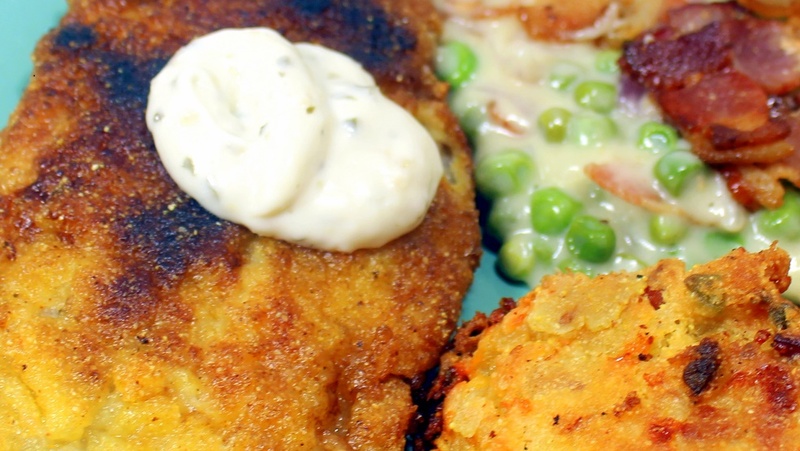 Serve warm with a dollop of Tartar Sauce and ENJOY!